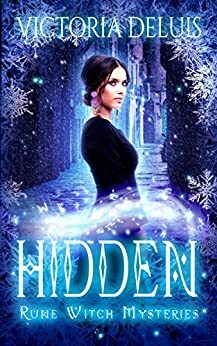 Hidden: The Rune Witch Mysteries is the second book in a supernatural romantic suspense quartet. If you like magic, mystery, and mythology with a dash of romance, then you’ll love this series by Victoria DeLuis. 5.0 out of 5 stars5 Stars! Great series! I liked this book even more than the first! It is a cozy mystery, but it has enough twists and turns to keep you guessing. I like how strong Thomas and Summer are as a team. They know that their bond is strong and it helps them throughout the case. When a dead body shows up in Summer’s forest one day, she and Thomas are sent on a whirlwind chase for a killer. Is it an old enemy, a new entity or the family curse coming to take them out? We learn lots of interesting things and meet some pretty great characters. I loved the ending and can’t wait to see how prominent the curse is in book three! I would recommend this series to anyone who enjoys paranormal romance suspense stories. They are fast stories and great reads. I voluntarily received and reviewed an advanced copy of this book. -Though I did buy myself my own copy. Thomas and Summer discover a body in the forest just outside their home. Of course they have to investigate especially since the authorities suspect them as being the murderers. Their snooping leads to a magical underground fighting pit and they are caught in a magical promise they can’t refuse so Thomas is forced to fight a goblin. How it ends is something you will have to find out for yourself. At any rate, I love how Thomas and Summer play off of one another to solve a mystery. They have total trust and confidence in one another. Very refreshing. I love this series, especially its use of Welsh mythology and I love the rune tattoos that are the basis for Summer's magic. This installment has our heroes investigating the death of a young man dumped in her forest and goes more deeply into the relationship between her and Thomas. Great fun.